Practice the questions given in the worksheet on third grade mixed addition and subtraction. 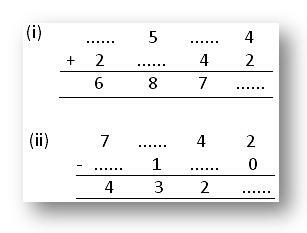 These worksheets provide basic questions involving mixed operations to find their sum and difference. 6. Subtract the sum of 493 and 627 from 3725. 7. Subtract the difference of 5439 and 4391 from 3576. 8. How much more is the sum of 893 and 768 than their difference? 9. Find the greatest and smallest number with the digits 1, 2, 3 and 4. Find the sum and difference of these two numbers. No digit should be repeated in either of the numbers. 10. The difference between two numbers is 183. The smaller number is 4359. Find the greater number. 11. Add 2725 and 1368 and subtract 2895 from the sum. 13. This is a magic square having 3 columns and 3 rows. If we add the numbers vertically, horizontally or diagonally, we get the same total. In this square we have used the numbers 1 to 9 and the same total we get, is 15. Similarly make the following magic squares. 14. Write the numbers 10, 20, 30, 40, 50 and 60 in the circles in such a way that by adding the numbers on each side, the sum becomes 90. Answers for the worksheet on third grade mixed addition and subtraction are given below to check the exact answers of above mixed problems involving the operations of addition and subtraction.